Great Gifts CD Blog Hop! Today's project is in celebration of the launch of the NEW Great Gifts CD from The Technique Junkie Newsletter! 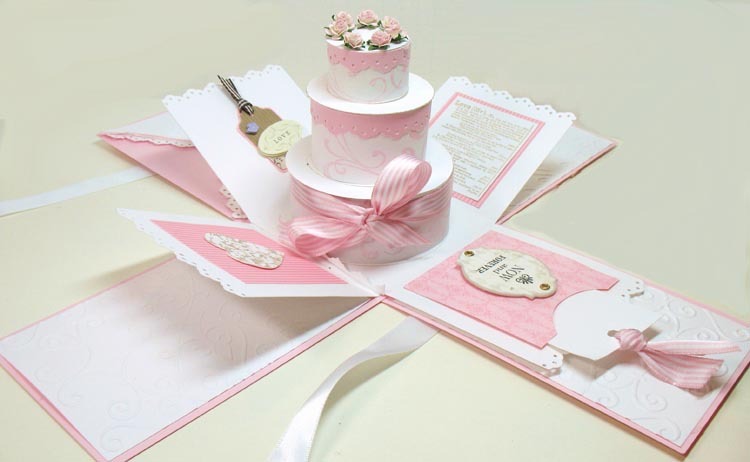 The CD contains 40 paper crafting projects with gifts for all occasions. There are boxes, bags, surprises and even explosions on this CD! The CD is just $14.95 plus postage. A full list of what is on the CD – with pictures of each project – is available http://techniquejunkies.com/great-gifts-cd.html. If you started here, you may want to head back to the Design Team blog, so you can see all of the gorgeous artwork from the beginning. 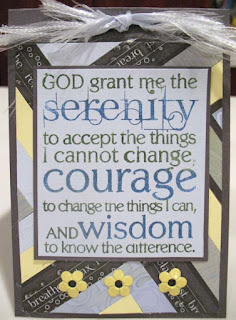 If you arrived here from Shelly Schmidt's blog, you are in the right place! Wasn't all the artwork a treat? 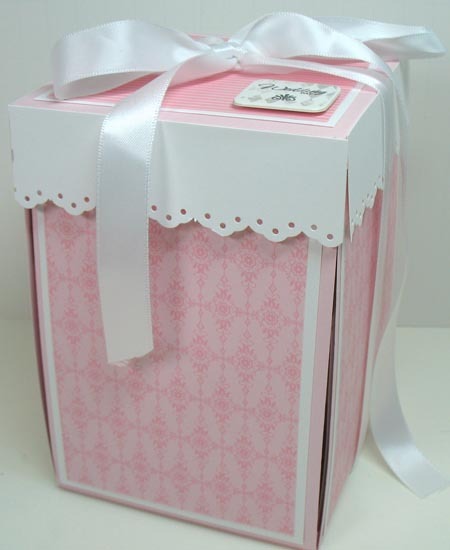 The project I am featuring from the CD is the Wedding Cake Explosion Box. 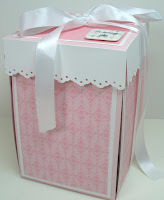 I had seen this box using a die cut for the cake (or square cakes) -- which I don't have -- and I was inspired to create a tutorial for making everything by hand. I love how this turned out! I know I was successful -- my 17 year old son told me it was the "coolest thing I had ever made." Even he loves to close the box and reopen it. High praise from a boy who hasn't stamped with me since he was seven! In any case, when I created the explosion box, I made sure to include a space in the box for adding a check or money, plus a spot to write a personal note to the bride and groom. And hey, who says this has to be a Wedding Cake? How about making a birthday cake instead? It's easy to order the CD, too! Use the link below to order. Thanks for stopping by today! More to samples to come all month. I hope you enjoyed the hop. 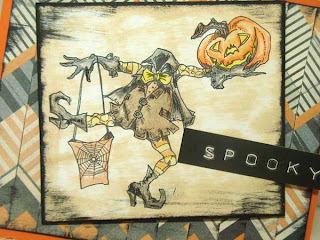 When I saw this ubercool image from I Brake for Stamps, I was enamored! I love the Legend of Sleepy Hollow and the Headless Horseman, and this image is a fun representation of it. 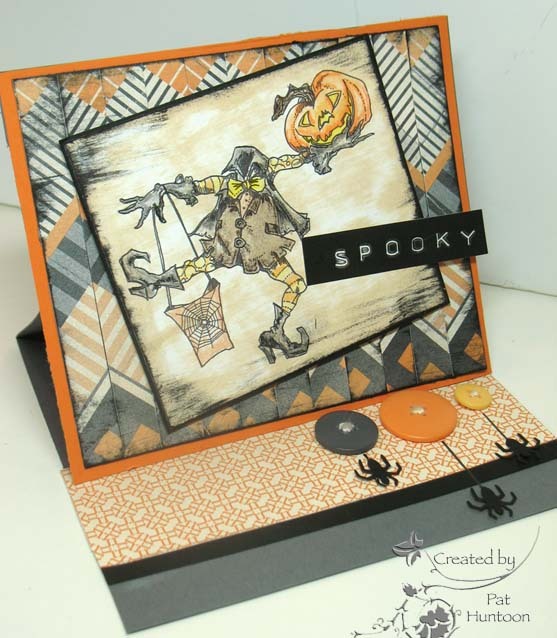 I used a few techniques from the Technique Junkie Newsletter to create this easy easel card, too. The first, of course, is the Easel Card. We have an Easel Card Tutorial on the 3D and Fun Folds CD. Second, the background is the Zig-Zag Technique. 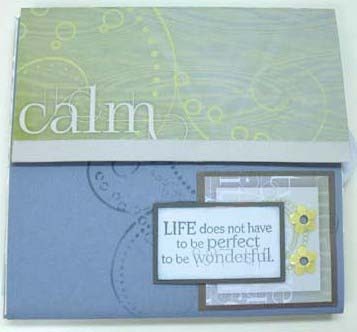 This can be found on the Stampin' Companion CD. The background was straight lines when I started! No Halloween card it worth it's salt without a spider, right? I had some fun with the buttons, too! 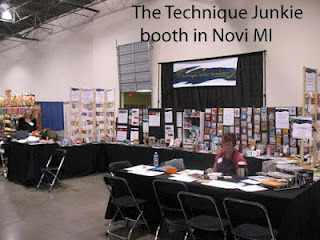 Don't forget that Technique Junkies get 10% off at I Brake for Stamps, too -- use Code TJ10 at checkout. Have a great day! I am a lucky girl. Club Scrap asked me to be the guest blogger for them today. I was please to create a mini album using the September Serenity kit. 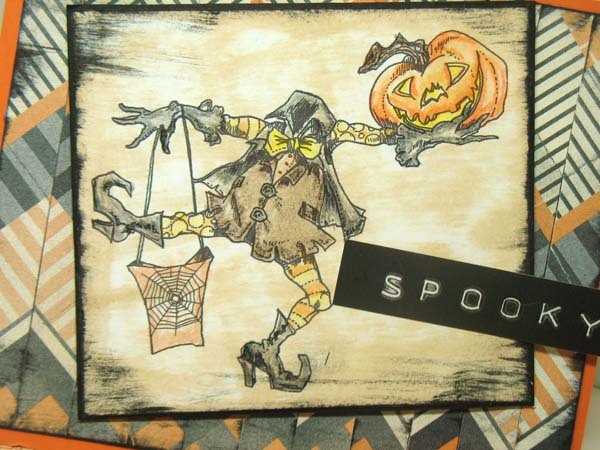 You can see the album -- and all of the pages, on the Club Scrap Blog. I used the Pocket Flip Album from the Mini Album Mania CD. Go look at the pages on the CS blog! I love the kit I was working with. It is a beautiful, melodious kit (can you call a pack of paper melodious? This one "sang" top me, so I think you can!). After making the album (and yes, I included a link to the pdf to make the album right in the post) I still have a ton of paper left to make more pages, albums and cards. That is the beauty of Club Scrap -- it really is a very good value. This is a card that I made from the scraps after the album was done. It uses the Herringbone Technique (December 2005 Technique Junkie Newsletter), the Frayed Ribbon Technique (August 2012 issue) and the Brush Wash Technique (from October 2002's issue). Okay, finally, if you have been thinking about the CD, you should know that the index to the CD is available on the TJ homepage, or the Mini Album Mania Page. The index has a picture of each of the 35 projects on the CD. I hope you will consider it -- the $14.95 (plus shipping) for the CD is well worth it! Many thanks to Club Scrap for hosting me today! 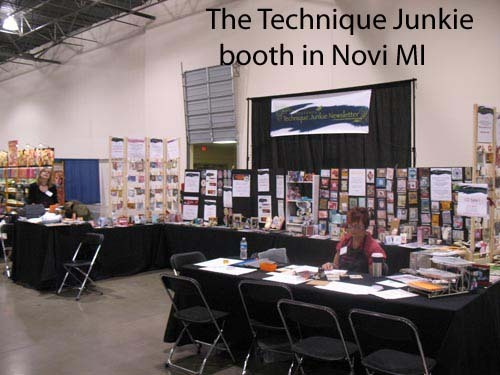 We head off tomorrow for Westminster MD for the Stamp Scrap Art Tour Show. If you live in the area, please stop by - I would love to meet you! CD10 will be mailed next week (I thought I was to have them today, but no packages today!). Remember that there is a $2.00 discount for ordering the CD and renewing your subscription through September 15th.This offer will NOT be extended, though! Order today to have your CD sent next week. Just order like normal from the drop down box through PayPal HERE (http://www.techniquejunkies.com/newsletter-renewals.html) and I will refund the $2.00 when I process your order. Note: Canadian, Overseas and online-only users, scroll down to your area. After this show, I will be home for a few weeks and I can't wait to show you what has been occupying my time this summer. Let's just say that Jane Bosi and I have been busy bees. We have created some of the coolest stuff ever! It will all be available October 1st, too. Have a great weekend and stop by our booth if you live close to Westminster!